Questions, questions, and more questions.. they consume Jocelyn Timmons’ life—both of them. Questions that never seem to have an answer. They haunt her, eat at her, and dreams of a normal senior year of high school have finally floated away into nothingness. Inheriting the gift of EVE (Essence Voyager Era) has become both a gift and a curse. One that Jocelyn doesn’t know if she wants or can accept. The world she once knew and thrived in has all but disappeared in the last two months. And now she wonders if she can ever find her way home again. Her fiancé, Jackson Chandler, and his family seem to be the only ones who understand what she’s going through besides her uncles, both of which she’s grown very close to. But even they do not fully grasp how turbulent the situation at home has become. Will Jocelyn survive the torments from her mother and brother? Or will she find a hidden key to finally unlock her golden cage? So here we go, the third book in the Eve Series and my thoughts are all over the place. Don't get me wrong I absolutely loved this book and this whole series so much, but again with the twists and turns, this series never ceases to amaze me. I know I said that same thing in the last review of the second book, but it still rings true now that I've read the third book. Also I wanted to talk for a few seconds about this cover and all the covers of this series, how amazing are these covers? They are beautiful! 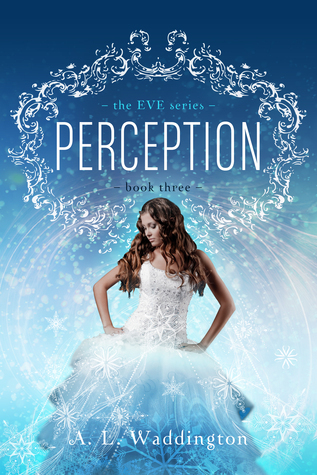 Alright, let's get down to the nitty gritty about this book, now that we've covered the cover and how emotional I am after reading Perception. I will say I found this book leaning toward the darker side of the genre a bit more than I thought it would, but I actually liked that fact. The main character, Jocelyn's, life has pretty much been turned upside down and she's got family turning against her and becoming hostile and to be honest I was waiting for that to happen and when it did I smiled to myself. This was the first time I actually saw something coming when reading this series. So therefore I was pretty proud of myself. I really enjoy watching the characters grow in this series and can't wait to see each of them grow more. We do get to see a new character in this book and I was happy about that. Not sure my actual feelings toward him, but we shall see in the next book. Which I have to say I can't wait to read! I can say without a shadow of doubt Perception and this whole series so far are my favorite books I've read this year. I really enjoy the writing style of A. L. Waddington and can't wait to read more of her books in the future. I don't want to say much more because I hate spoilers and don't want to accidentally give anything away but I must say that I love Jackson and Jocelyn together. They are my new favorite book couple! Again if you haven't read this series, it's a must. Get your copy today and let me know what you think of The Eve Series and this fantastic author A. L. Waddington. And it fully deserves this rating to the max, if I could give it a higher rating I so would.